We were tempted to just get more massages, but T thought we should work for it first. 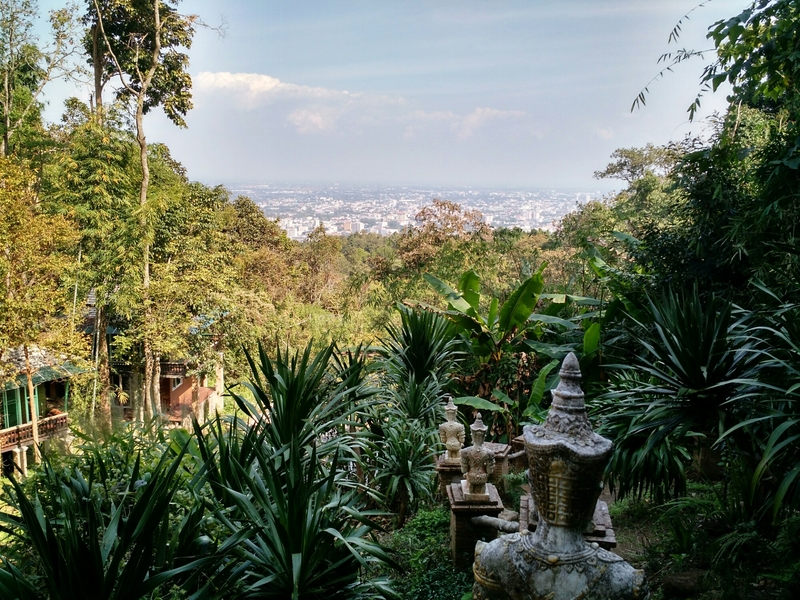 While the guesthouse offered 50 versions of tours and hikes, my hacker had found blogs that suggested you could find a trail behind the university which would take you to the top of the mountain. 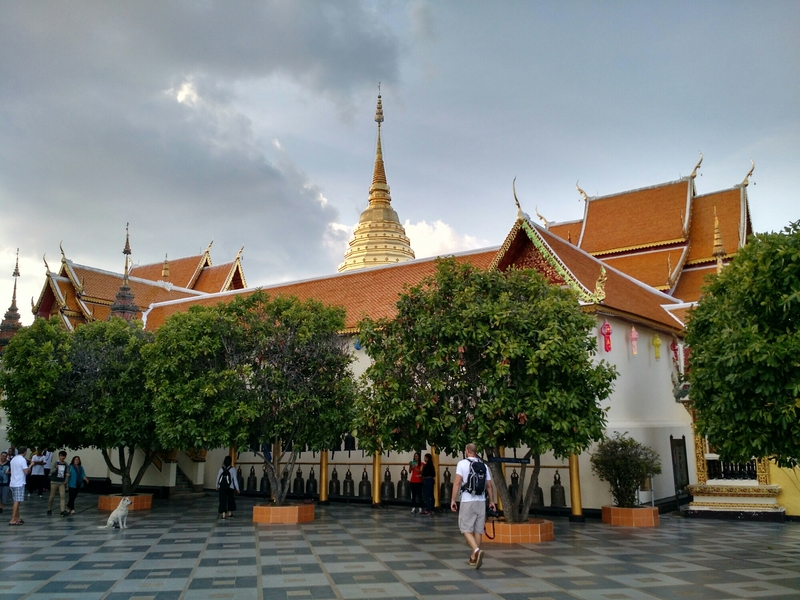 So first stop was the Chiang Mai University, and lo and behold Wednesday was graduation day! Balloons, flowers, families but no spare diplomas for us. Onward! We made it to a trailhead. Yes, I had. But what he meant was had I memorized it so I’d know if were on the path. Nope. However, I saw a Thai map at the trailhead and took a picture to reference later. Between our two tools (or us two tools? 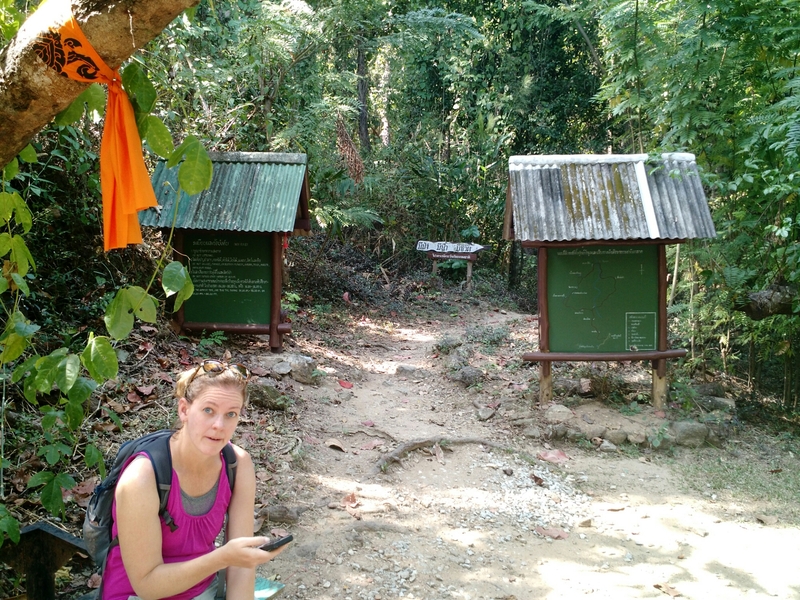 ), we navigated a shaded jungle climb up the mountain. 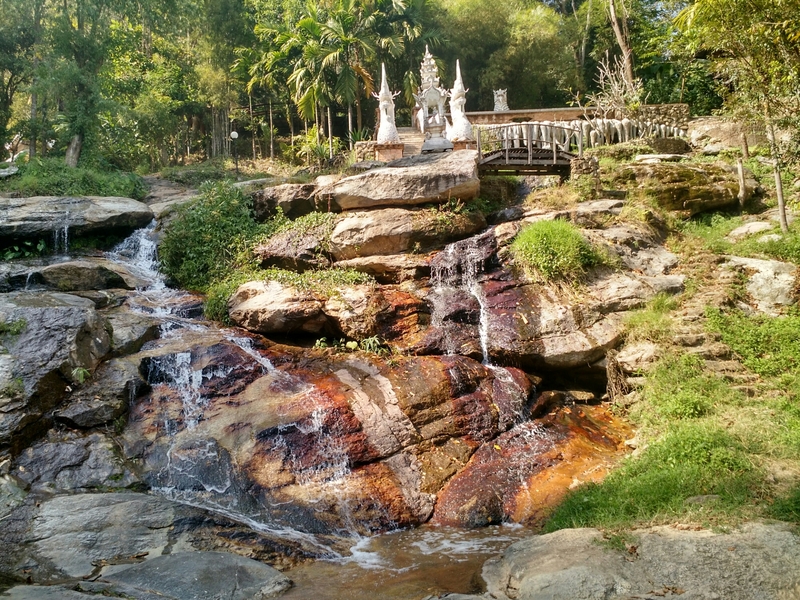 On the path, monks had built a monastery by a waterfall; we might have been wise to call it a day here, but we kept going! 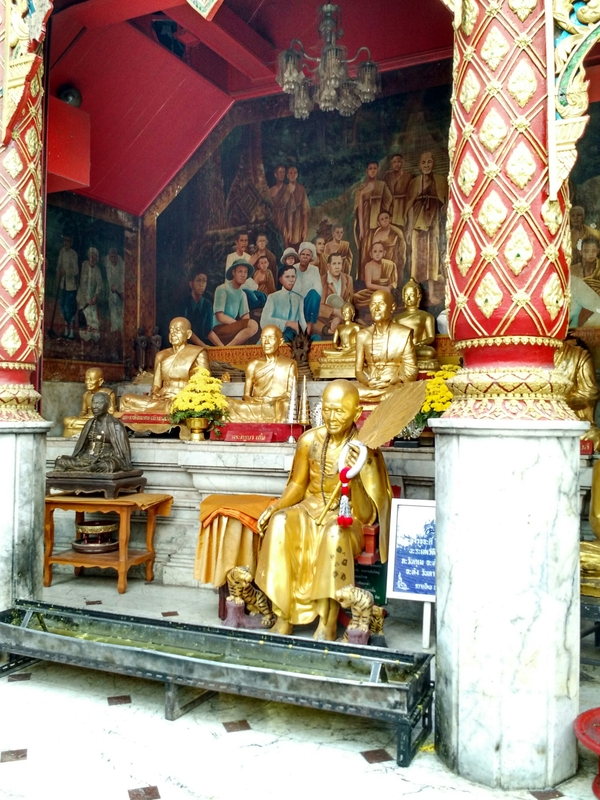 By the time we made it to the top, I insisted we take the elevator to the Doi Suthep temple as I doubted I had energy for the 304 steps to the top, though I knew I needed some more spiritual rejuvenation (or at least hydration). At the top we found better-rested tourists by the hundreds which made me appreciate our solo jungle climb. As the photographer made his rounds, I marveled at a mural which seemed to feature in the crowd a white pilgrim in shorts, which is supposedly taboo. Things that make me go hmmm. But the treat if my day was a reunion with Polly, a globe trotter and good friend from South Africa days. 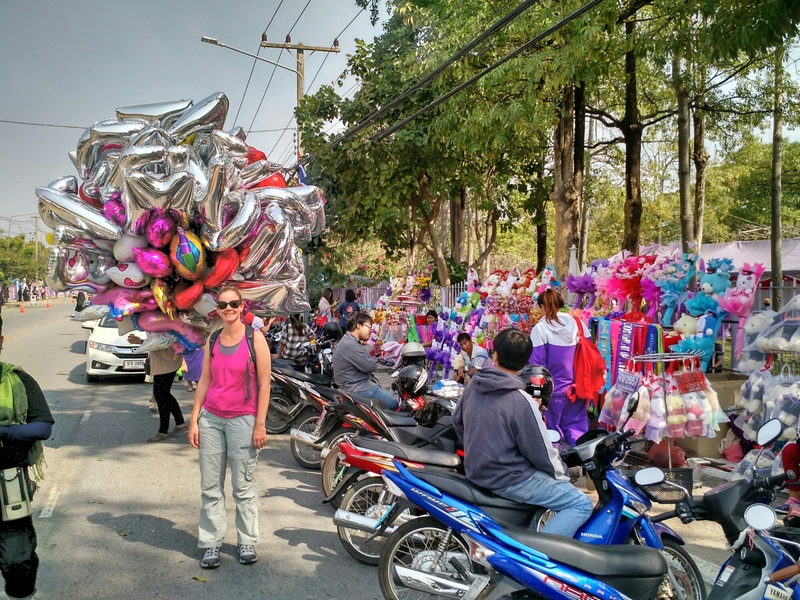 Polly’s core of beliefs are more solid than any six pack, and her laugh more contagious than “Shake it off!” I was eager to hear about her adventures in Myanmar and latest projects. She’s never failed to lend her brain and stamina to noble ventures, and I wanted to sign up to be her intern for the next month. As a Thai guitarist wearing sunglasses at night sang Yaz, I was a happy camper.